With deep sense of regret, one cannot help but wonder if Black Africans are really anything higher than ape. According to Donald J. Trump, president of the United States of America, "the fact that Blacks and Arabs look like human does not necessarily make them sensible human beings. Hedgehogs are not porcupines; and lizards are not crocodiles just because they look alike. If God had wanted us to be equal to Blacks and Arabs, he would have created us all of a uniform colour and intellect. But he created us differently: Whites, Blacks, Yellow, the ruler and the ruled." The above assertion might not be generally true but is still true for the major population of the blacks. Trump wrote further: "The worst tragedy in Africa is that if you dare stand up and speak up for what is right, you may end up regretting. The few wise and open-minded Africans who have tried to educate these fools about civilization have met the worst. They have been pushed hard on the wall, they have been silenced and others have been killed." A Nigerian does not think, hence the highest problem you can confront them with is to expose them to a situation that necessitates the use of their thinking cap. The Prime Minister of the United Kingdom can never leave office for an undisclosed ailment for over 40 days and without addressing UK citizens. Britons know that, but they are sure that Nigerians are not audacious enough to challenge the case. 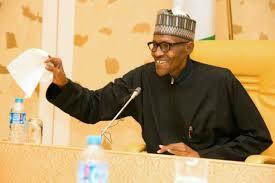 It got worse that even Muhammadu Buhari's (the president of Nigeria) media aides were dishing out conflicting reports about his health status. When Late President Umaru Musa Yar'Adua died in this same manner, this same group of Fulani Jihadists, told their "butter brain" citizens that "the president can rule from anywhere". Thanks to Professor Dora Akunyili, a Biafran, who challenged these fools and made sure that the rule of law was placed over and above political arrogance. Laughable as this current dance of shame might be, Biafra Writers still found it needful to analyse this illusionary return of the ghost president of Nigeria; perhaps it might drag some minds to think and see reasons why Nigeria is made up of "savages and animals." (1) The Vice president, Senate President, Minister of Foreign affairs and other non-Hausa-Fulani top government officials were not present to welcome the masked man at the airport. (2) The British-made-Buhari never said a word neither did he smile to the herdsmen present at the airport. (3) We were told he came in at about 5am but the footage that was shown was captured in the afternoon. (4) He was absent at the Friday prayer at Abuja mosque on health grounds. (5) According to his aides, he will soon depart to London again to continue his medication (so that a new count of 3 months will start). (6) Information reaching us confirms that if Buhari must address his gullible followers, it has to be a presentation of a recorded clip; ie, it will not be a live speech and no journalist is allowed to personally interview him. (7) This return shows also that despite Buhari's failure, the Northerners are ready to vote for him again and again. They don't care about his performance. In other words, their hatred for Goodluck Jonathan was not based on performance (actions speak louder than voice). (6) Yorubas lack every thing it takes to challenge the Fulani despots in Nigeria, hence they will exhaust all resources at their disposal just to frustrate and hinder the restoration of Biafra. But who can challenge this if not Biafrans? Who will be deceived of not the Islamic nomads? And who will keep silent in the face of injustice if not the Afonjas and the likes? The above can only happen in a Black African country, maybe an Arab country too. It goes further to show that the West has successfully reduced the Black race to a perpetual slave. The mental decay and inferiority complex of Blacks are obviously in an exponential increase and redemption seems impossible. Indeed, "in Biafra, Africa died." This article is wholly dedicated to Professor Dora Akunyili, a gallant Biafran we miss so much! Rest on!! Buhari's return is the biggest fraud, deception and hypocrisy of the Hausa-Fulani and British Empire against Nigeria and Biafra. I'm even so angry that the leader of the Anglican Communion - Archbishop Justin Welby is embroiled in this satanic conspiracy. May God save us from these evil British people! As long as the earth endure, Nigeria/Sub Sahara Africa will remain enslaved and improvised. Our inability to question injustice, atrocity, and enslavement of Black Africa by the White man and off-course the monumental atrocity and tragedy of Africans by the British, French, Portuguese, and so forth is unfathomable. Biafra must do whatever it takes to liberate our people and land from these evil and murderous people. Are you saying that there is a body-double of Buhari? And also that the British still control much of what transpires in the #Zoo of Nigeria?